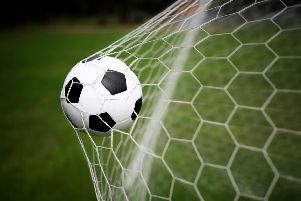 Lavant got back to winning ways in the West Sussex League premier division after the disappointment of their Malcolm Simmonds Cup exit the previous week - with a 3-0 win at Upper Beeding. With the pitch only just playable, it was never going to be a game of fancy football and Lavant decided to adopt a more direct approach which bypassed Beeding’s extra man in midfield. Beeding started well, making Lavant’s midfield quartet work extremely hard. The physicality of frontman Garnham was posing a threat but Matt Lyttle and Paul Jones were equal to the task. Lavant stuck to their game plan, getting the ball in behind the full-backs with both frontmen willing runners into the channels. This approach soon paid dividends, with the impressive Ollie Haggar being set free to superbly finish from an acute angle. Beeding responded with neat build-up play but Lavant grafted to snuff out any threats. On the half-hour, Lavant were awarded a penalty following a blatant shove from the Beeding keeper following a Lavant corner. James Brooks confidently stepped up and scored to put behind him a crucial penalty miss at home. Lavant still weren’t done for the half. Haggar picked the ball up deep and drove at the Beeding defence with an intelligent run by James Sandford taking two defenders away, allowing Haggar to run free and clip the ball over the stranded Beeding stopper on the stroke of half-time. With a valuable lesson learnt from the previous week, Lavant were out early and raring to go. Beeding were almost gifted an opportunity in the opening minutes, Lyttle being caught in possession but recovering well. Beeding continued to press and were virtually camped in Lavant’s half, but the defence stuck to their duties with desire and tenacity. Lavant looked dangerous on the break and on another day Haggar could have come away with a hat-trick. This week sees Lavant host fellow premier-division side West Chiltington in the Sussex Intermediate Cup in what promises to be a fantastic tie. LAVANT: Sanson, Gabb, Wright, Jones, Lyttle, Hancock, Brooks, Neville, Taylor, Haggar, Sandford. Sub: Yaxley.